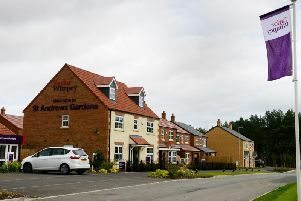 Three more new homes have been approved in a hamlet near Ponteland, which has been the focus of dozens of planning applications in recent years. At Monday’s meeting of the county council’s Castle Morpeth Local Area Council, members approved two applications in Medburn – one for a detached two-storey dwelling and detached double garage in the former grounds of Harrison Hall and the other for two homes on land north of Burnlea. As highlighted by one of the objectors, Medburn has seen approval given for 40 new homes off The Avenue, an unadopted private road, in the past two years. Coun Katrina Woodrow, from Ponteland Town Council, said there’s been ‘less consideration to residents than would have been given to bats and newts’, with all the new development and construction having an ‘overwhelming and adverse impact on this small hamlet’. At last month’s meeting, councillors decided to take a stand and refuse a bid for Medburn, with Coun Richard Dodd describing the road as ‘a bombsite’. A highways officer said the state of The Avenue was not felt to be grounds for refusal as a previous objection was rejected by a planning inspector at appeal in relation to a refused application for new homes back in 2011. Members questioned whether this was still relevant given how long ago it was, but since that meeting, a new appeal decision has been issued, which confirms this previous stance. This meant that a motion to refuse the Harrison Hall proposal, by Coun Peter Jackson, was not supported. The second site, on land north of Burnlea, already had permission for one larger property and original proposals for two homes have been reduced in size for the current scheme. A bid for four new homes in the green belt around Morpeth has been rejected by councillors. The outline application, for land at Tranwell Airfield, was unanimously refused at the Castle Morpeth Local Area Council meeting, in line with the planning officer’s recommendation as it is an ‘unacceptable form of development’ in the open countryside and green belt. A previous scheme for four detached homes on the site had also been turned down, but it does have planning permission for four holiday lodges. Coun Susan Richardson, chairman of Whalton Parish Council, speaking on behalf of her council as well as Mitford, said that the site is ‘entirely in the green belt’ and that it shouldn’t be considered as previously developed because the airfield hasn’t been used since the war 70 years ago. But the agent, Craig Ross, from George F White, explained that the homes were for different members of the applicant’s family and that the proposal was for just four houses on a wider site which could accommodate 200. Coun David Bawn added: “I’m very pleased that weight’s been given to the archaeological potential of the site.